Anthurium flower are the perfect flower from which to conjure up your tropical floral arrangements. Also known as the Flamingo Flower. The Anthurium flowers are available in spectacular colors of white, red, green pink. 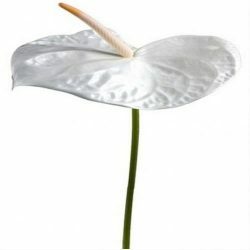 The elegant and purity of White Anthurium makes it a popular color choice for weddings. Anthuriums offer a professional appeal too and fits in well with corporate event floral decorations. Make the perfect table centerpieces for business luncheons or formal dinners. You can think up the perfect floral arrangement with our Anthurium flowers, as your focal flower or combine them with other tropical flower and foliage. Therefore, Anthurium flowers are perfect for a tropical island themed wedding or event. 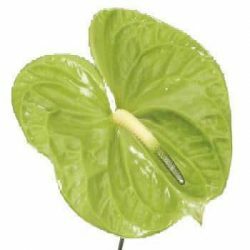 Buy Anthurium flower in bulk flowers online for weddings and special occasions.